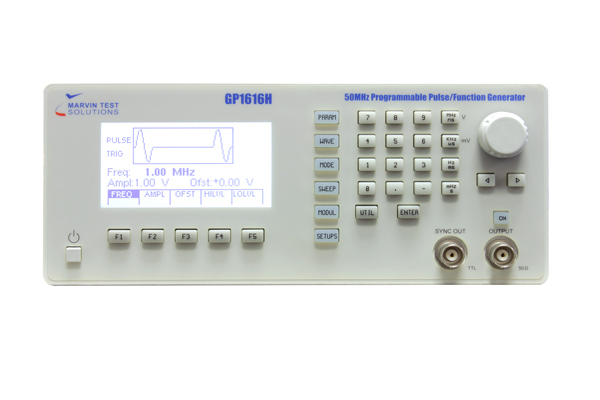 HP 8116A Compatible Signal Source / Function Generator - GP1616H | Marvin Test Solutions, Inc. The GP1616H function generator is a programmable instrument capable of generating predefined Sine, Square, Triangle, Ramp, Haversine, Haver triangle and Pulse waveforms as well as a programmable DC output. The firmware is customized to be fully compatible with the HP 8116A GPIB command set. Software test procedures using the original HP8116A instrument require no code modification when upgrading to the GP1616H. The GP1616H offers phase-lock loop (PLL) stability and accuracy for generating signals up to 50 MHz. Full programmability of all waveforms as well as pulse width and duty cycle parameters are supported. Additionally, the GP1616H supports internal / external logarithmic sweep and counted burst functionality. Frequency, amplitude, and pulse width modulation modes are also supported when used with an external modulation source. Trigger Active input edge generates one output cycle. Gate Active level enables output cycles. First and last output cycles are always completed. Counted Burst A preprogrammed number of output cycles (1 to 1999) are generated. Minimum time between bursts is 100 ns when triggered by an external trigger.